Calling folk instrumentalists of all ages! 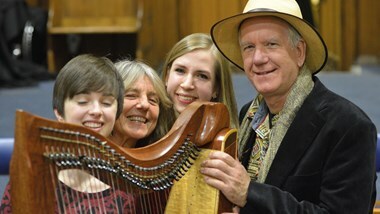 An opportunity to play new arrangements and get your feet tapping with a vivid selection of tunes and songs from the British and Irish folk traditions. Tutors: Jon Bennett and Liz van Santen both regularly run Folk Orchestra at Benslow Music, and are multi instrumentalists who play in the well-established local band, Moonrakers. Do look them up on the website address provided below! Whatever acoustic instrument you play (fiddle, fretted instruments, whistles/flute, squeeze boxes, etc) you're welcome! Our tutors specialise in singing, fretted instruments, whistles and fiddle, but we'll have parts for anything you bring. We’ll work through a number of tunes and songs with arrangements throughout the day. You don't need to read music, but no absolute beginners, please. The day workshop will conclude with a short concert showcasing the course participant folk orchestra and their musical achievements! Members of the Moonrakers will also play a few songs and tunes. This informal concert is open to family and friends.